Each loss cuts just as deeply as the last. Our hearts were not yet healed and once again the wound is ripped open. After 17 ½ years on this earth, age took our dear Geronimo to be with his brothers who had left him years ago. Yet even when death comes naturally, we still grieve deeply at the loss of our Geronimo and will miss his enduring presence in the Big Pack. Geronimo was born in the Big Pack on February 15, 2000. He walked through life in an unhurried fashion, choosing a more submissive role in the pack than his brothers who would grow up to become assertive and dominant leaders of the Big Pack. Geronimo chose to submit to their leadership, not in fear, but because he was content to be Omega. Being the Omega, Geronimo was the last to eat at mealtimes and when it came to treats on tour. He was known to hang back away from the fence, hoping that a tour guide might toss him a treat. Even when a treat was tossed, though, he would only accept it if he was able to catch it in the air. If it hit his paw or fell to the ground, he would step away and relinquish his prize to a more dominant pack-member. At mealtimes, though, it was always clear that Geronimo’s rank as Omega was indeed his own preference, it was a path he chose. Never challenging his family members, he was content to wait his turn for the meal. He did not wait idly, though. Geronimo observed. He watched each of his family members take their meat, eat their fill, and bury their leftovers to preserve them. After the meal, his family would close their eyes, happily napping with full bellies. Geronimo would not nap, but instead would travel to each food cache, eating his fill and reaping his reward for his sharp memory and cunning intellect. As he aged, his pace slowed down a bit but he never lost that twinkle in his eye that won the hearts of many guests and volunteers. In recent months during mealtimes he was the last to arrive for the meal. He never hurried, he just made his way through his territory slowly and steadily, knowing that everyone would wait patiently for him to appear through the trees. Geronimo always seemed to have a carefree whimsical expression as though he was simply content to be wherever he was at the time. 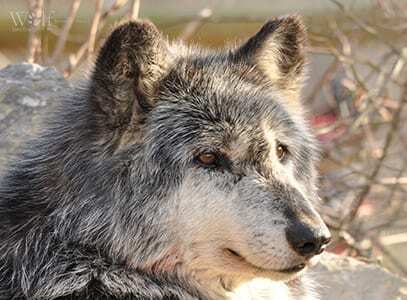 Though he remained an Omega throughout his life, he seemed to gain a degree of respect from his younger pack members who would sometimes show him signs of respect just before the pack howl by licking his jaws and face, just as they would do to the most dominant members of the pack. Geronimo taught us that a true Omega is not characterized by weakness or fear, but instead by patience, tolerance, and humility. Farewell Geronimo, your gentle carefree spirit will be greatly missed by all at Speedwell and your bright and easy soul will not be forgotten.